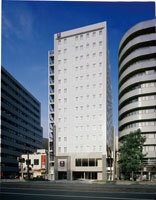 Comfort Hotel Hiroshima Otemachi is located at the center of government and business district and near to the Peace Memorial Park. The access is excellent just 1 minute walk from streetcar Chuden-mae Station. Complementary breakfast is served and free internet connection is available in room. 20 minutes on streetcar from JR Hiroshima Station and get off at Chuden-mae, 1 minute walk.